You’re a farmer. What are you gonna do? Farm, probably. Seems simple enough. Farming is the first, and for some players foremost way to turn a profit in Stardew Valley. It is the act of planting crops, watering those crops, and then selling them at market. Seems like a simple enough proposition, but there are so many crops available and so many ways to maintain them that you’ll need more than just the basic knowledge contained in the introductory article. We’ll look at more advanced farming methods here. In order to successfully grow any crop you need to follow these four basic steps. If you fail to do so your crops will either grow slowly or not at all. We’ll look at each of these steps in turn. Tilling the land is pretty easy. Pull out your Hoe and click on a dirt space to make a hole in the ground. Congrats. You have officially tilled your first piece of farm land. Keep doing this and you’ll soon have a small field appropriate for growing your crops. Is it that easy? No. There are a few more considerations to make. You only have so much Energy to commit to watering and picking veg every day. You should capitalize on your time and effort by setting up your fields so they’re nice and orderly. Ideally you’ll want square / rectangular fields, consisting of neat, identifiable rows. 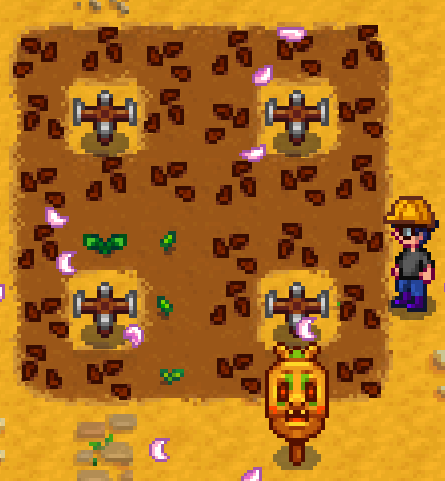 Planting crops willy-nilly in random places makes maintenance both wasteful and annoying. Crops are vulnerable. Not at first, perhaps, but as your Seeds grow into sprouts and begin to bear vegetables you’ll run the risk of having your plants pilfered by crows. It’s best to waylay this risk by setting up Scarecrows before you even lay out your fields. Each Scarecrow protects roughly twenty squares around itself, which is considerable - but if your farm gets larger you’ll inevitably need more Scarecrows. Positioning Scarecrows between multiple fields provides ideal coverage. Before putting a Seed in the ground you should consider whether or not you want to use Fertilizer on your tilled soil. Fertilizer bestows a series of benefits, depending on the kind, and will result in either superior or faster-growing crops in most cases. You cannot place Fertilizer on a tile after a Seed is planted, so plan out your Fertilization in advance. Fertilizers can be purchased at Pierre’s or Crafted if you have the proper know-how and materials. Fertilizer will last throughout a single season. Once that season ends, the Fertilizer effect on every tile on your farm disappears. You won’t get very far in your farming efforts without Seeds, as they’re the key component in creating crops. Seeds come in a large number of varieties, growing at different rates and offering different returns on your initial investment. Generally speaking the longer a Seed takes to grow, the more it’s going to cost. Seeds, too, come with additional considerations. Every crop grows at different rates, and you need to plan your calendar accordingly. Will you have time to uproot completed crops on the day they’re going to mature? Will your crops get in the way of doing something else? Will your crops mature quickly enough if they’re going to be used to fulfill the requirements of a quest? Every month has twenty-eight days, so plan carefully. The most important consideration as to growing time is whether or not crops will mature before the end of a season. With very few exceptions (the only one I can think of offhand is Corn) crops wither and die whenever you enter a new season. You should never plant crops that will not mature in time. It’s a big waste of money. You should also be careful with plants that bear Seeds multiple times in a season, as it’s not cost-effective to plant them in, say, the final third of the month, where you might only get one harvest at most. 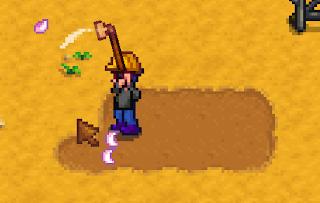 It takes a long time to maintain crops early in the game, as you’re equipped with a Watering Can and your own muscles. You’ll eventually gain methods for easily watering large number of crops later in the game, but you initially need to decide whether the number of Seeds you can afford to plant is worth your time in Energy. If you’re bordering on sleep by the time you’re done watering your crops each day, you have too many crops. This borders on material covered above, but there’s another aspect you need to keep in mind when planting Seeds: whether they’re in danger of getting chopped to pieces. It is amazingly easy to cut up your plants accidentally with a careless swing of your Axe or Scythe. Don’t plant Seeds in place where they’re going to be sliced up if you accidentally hit the button. Seeds need to be watered every day to progress towards full-blown crops. Unwatered Seeds will lag behind their watered brethren in maturation, and may simply die if left unwatered for too long. Watering takes a long time to perform, however, particularly when you need to make constant refill runs to the pond by your house. Here are some things to keep in mind pertaining to watering your crops. Refilling your Watering Can is a painful nuisance. Time it as well as you like, but you’ll inevitably have to head back to the watering hole every now and then. You can offset the time between refills by upgrading your Watering Can at Clint’s Blacksmith. More on upgrading tools in this article. Annoyed by the distance between watering hole and your crops? Check in with Robin at the Carpenter’s Shop. She will offer to construct a Well on your property for 1,000 gold and 75 gold, which, compared to some of her other projects, is pretty cheap. You can pepper your property with Wells and ease your burdens a bit. Building your fields around the well is a great way to minimize travel times. Manual labour is all well and good, but you’ll ultimately want to automate your watering. This is where Sprinklers come in. Sprinklers come in four varieties - Sprinkler, Quality Sprinkler, and Iridium Sprinkler - and all three will water your crops for you each morning. Normal Sprinklers are a bit useless, but Quality Sprinklers and Iridium Sprinklers cover eight and twenty-four adjacent squares, respectively, and can be moved around your property as you like. In order to get Quality Sprinklers you’ll need a Farming Skill of six, as well as an Iron Bar, a Gold Bar, and a Quartz Bar. The materials for all three are found in the Mines. 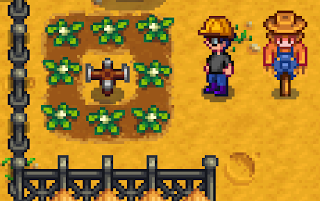 Iridium Sprinklers require a Farming Skill of nine, and require a Gold Bar, an Iridium Bar, and a Battery Pack. You’ll need to head to Calico Desert’s Skull Dungeon to get many of the pieces for this handy tool. Assuming you’ve done everything else right, you now need to harvest your crops. Pull them out of the ground, then drop them into the box by your house. You’ll get paid for your bounty overnight. The payoff is inevitable… but, alas, there are things to consider here, too. As mentioned above, it’s waaaaay too easy to accidentally trash your plants. To offset this danger, never ever ever harvest your crops with a tool that can chop down plants equipped. One wrong click and you’ll lose one plant, if not more. There are a lot of quests in Stardew Valley, and many of them require items that you’ll harvest throughout the year. If you don’t want to be spoiled by walkthroughs, you can take these quests as they come - but you’ll run the risk of not having a crop when it’s in season. Consequently, it’s not a terrible idea to keep one of each crop you grow sitting in a storage box, just in case you need it in the future. If you don’t you can always gift it to someone. Many of the Recipes you can create in the kitchen of your house require items you create on the farm, including crops. Before you toss an entire load of veggies into the box, consider keeping a few back to throw into meals. Food is great for restoring Energy and HP, and makes great gifts if you’re trying to earn the affection of the townsfolk. 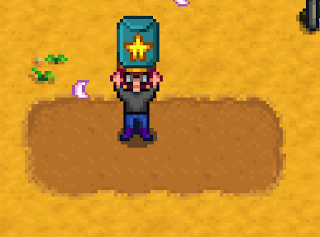 The final reason to hold back crops is for the golden scrolls in the Community Center. Many of the Bundles that comprise the Community Center’s challenges require grown crops, and you’ll need to wait out huge parts of the year if you need crops from specific seasons. Know what you need ahead of time, and plant accordingly. Note that this is only true if you leave the Community Center standing. 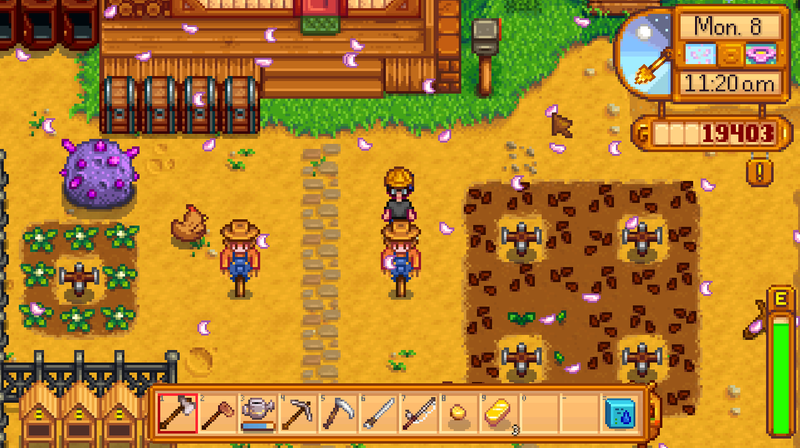 If you decide to purchase a Joja Mart membership the Community Center gets replaced by a warehouse, and any community improvements related to the Bundles are completed by paying Joja Mart lots and lots of money. The more you farm, the better you get. 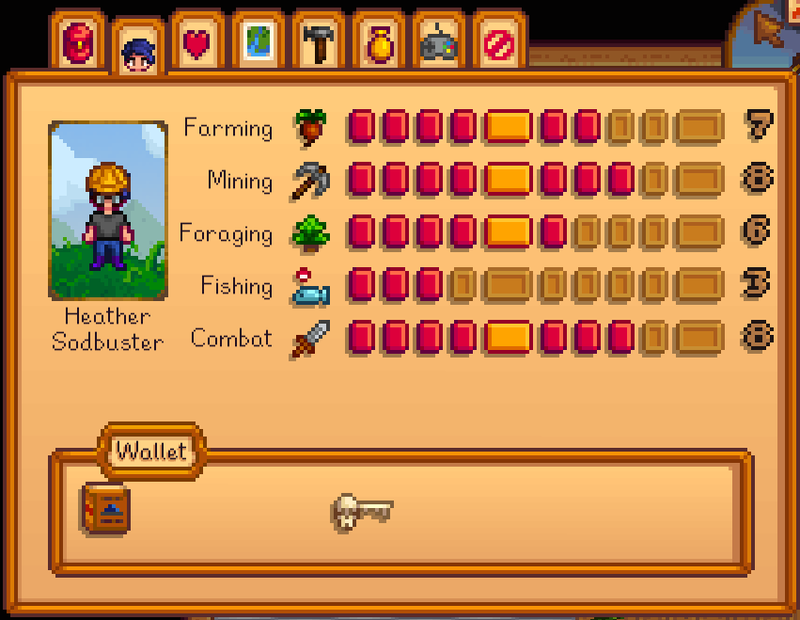 Like most activities in Stardew Valley, farming is linked intimately with a Skill - in this case, the aptly-named Farming. As you tend to your farm with greater zeal your Farming abilities will grow, allowing you to tend to your crops more efficiently and Craft new items. More on what you can do with this Skill in this article. Yes, farming in the frame of your screen can give you knowledge about the basics process of gardening but it will never substitute the pleasure of growing something from the seed, digging in the ground on your fours and reaping the harvest! My newest finding is https://nutgatherers.com tool for reaping the harvest. So much of fun and so easy to work with!